A journalist who has reported for nearly 30 years from Afghanistan, one of the world's most dangerous and difficult countries, is this year's recipient of the McGill Medal for Journalistic Courage. 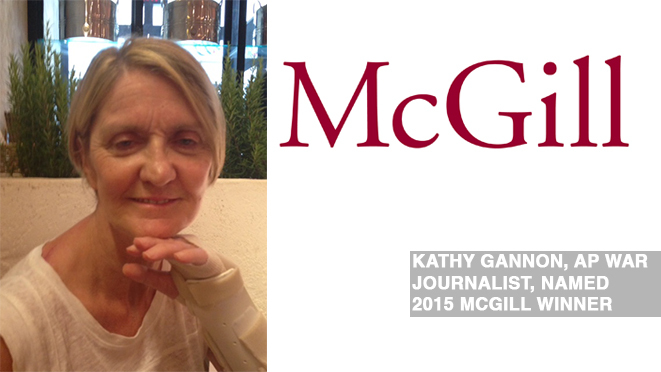 Kathy Gannon, a correspondent for the Associated Press, will receive the medal from the University of Georgia Grady College of Journalism and Mass Communication and its McGill Program in Journalistic Courage during a ceremony this spring. In 2014, Gannon was attacked and badly wounded by Afghan security forces while covering the presidential elections. Her AP colleague, Anja Niedringhaus, was killed in what was the first known case of security forces attacking journalists in Afghanistan. Gannon had been reporting from Afghanistan since 1986 — covering Taliban rule in the 1990s, the post-9/11 U.S. invasion in 2001 and subsequent 13-year war — and was not indifferent to the risks, according to AP editor Sally Jacobsen, who nominated Gannon on behalf of the news service. The McGill Medal is named for Ralph McGill, the late editor and publisher of the Atlanta Constitution. McGill was regarded by many as “the conscience of the South” for his editorials challenging racial segregation in the 1950s and 1960s. The selection was made by the 2014-2015 class of McGill Fellows, 12 undergraduate and graduate students chosen for academic achievement, practical experience and leadership. McGill Fellow Katy Roberts, a Senior journalism major from Johns Creek, wrote the briefing on Gannon. Six other journalists were nominated. The McGill Medal, now in its seventh year, is the latest development in the growth of the McGill program at UGA's Grady College. For 36 years, the McGill Lecture has brought significant figures in journalism to UGA to help the university honor McGill's courage as an editor. In 2007, UGA added the McGill Symposium, bringing together students, faculty and leading journalists to consider what journalistic courage means and how reporters and editors exemplify it. “All of this is for a single purpose: to advance journalistic courage,” said John F. Greenman, professor and Carter Chair in Journalism. Greenman and Diane H. Murray, the Grady College's director of alumni relations and outreach, oversee the McGill program. For more information on the program, see the McGill website.